An Accurate Map of Hindoostan, Drawn from the Latest Authorities. 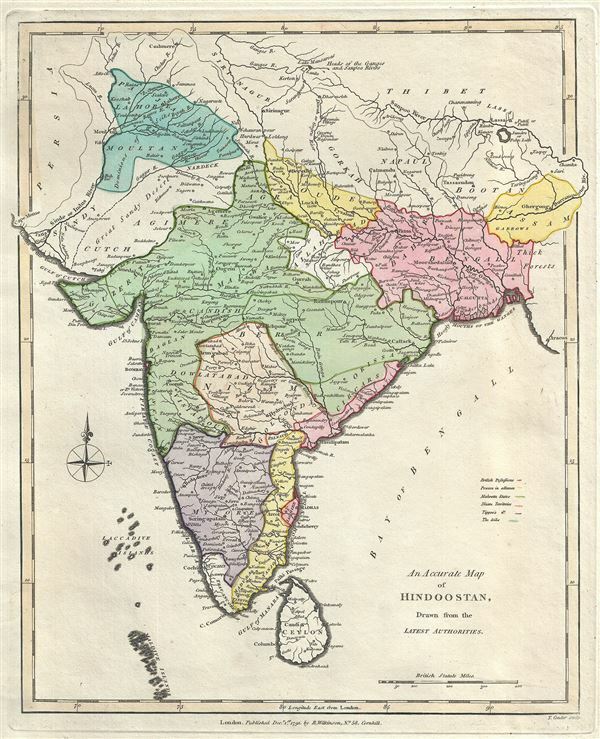 This is a lovely 1791 map of India by Robert Wilkinson. Wilkinson's map covers from Kabul and Persia in the northwest, to Cape Comorin, Ceylon and the Maldive Islands in the south, and from 'Thibet' in the northeast to Cape Negrais in what is now Myanmar ('Aracan Pegu' on the map). This fascinating map shows the possessions of the British, British allies, Karnatic, Nizam, Mahratta, the Seik, Timur Shah, Small States, and Tipu Sultan, as well as the location of different peoples or castes in the late 18th century, and is therefore a treasure for those interested in the history of South Asia or colonialism. This map was engraved by Thomas Conder and issued as plate no. 36 in the 1792 edition of Robert Wilkinson's General Atlas.